It seems like every set has a green instant that grants +2/+2 for a single mana, and incorporates a new set mechanic somehow. In this case, I'd say it's fairly effective, as this instant can turn the tide of combat even when you're tapped out (and thus your opponent thought it was safe to block the way he did). If you're using it to push damage through, paying 2 life to do 2 additional damage seems worth it to me, especially if you can play this on a creature with lifelink, infect, or double strike. Sadly, green doesn't get lifelink or double strike... but then you don't really need to be playing green to run Mutagenic Growth, and pump spells are always best when your opponent doesn't see them coming, aren't they? Depending on your point of view, Phyrexia's victory on Mirrodin marks the death of sanity and decency in a famous part of the multiverse. This week, things are also getting crazy in Magic players' sphere - crazy like a free Giant Growth in your mono-blue Flying Men deck or your Kiln Fiend burn deck. Some of the most popular and powerful spells in the game have been ones that can be played with things other than mana, and I expect New Phyrexia's version of the mechanic to join the pantheon. Just watch out for Mental Misstep. That thing goes in mono-green, y'know..
Paul Welcome back readers today’s card of the day happens to be one of my favorites in New Phyrexia. The ability to cast a pump spell for free is somewhat underwhelming until you think of putting it on an infect creature making your opponent dead twice as fast. In standard, extended and eternal I can see this seeing play in mono green infect pump style decks and I am eagerly awaiting testing this card, in eternal there are better pump options but the ability to cast this free cannot be overlooked. In casual this is a great pump option and you can often catch your opponents unaware, in multiplayer a single pump spell is not the best option overall. In limited it’s a solid pump spell that any deck can play although I don’t know how highly it should be picked. Overall one of my favorite cards of the set as it assists mono green infect decks. 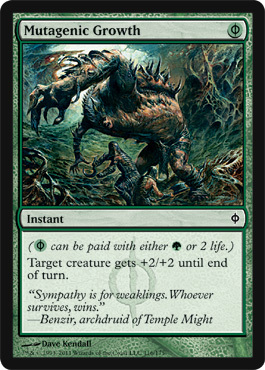 Today's card of the day is Mutagenic Growth which costs one mana or two life to give target creature +2/+2 until end of turn. In general only times you'd ever want to play this instead of Giant Growth is if you have no mana available or want to pay life for the effect instead. Otherwise Giant Growth at a single mana is quite affordable and readily available making this extremely situational. It works on the first turn, but few creatures are worth saving that early and it is unlikely to help against something like a Lightning Bolt and overall this card probably won't see a great deal of play in Green decks. Other colors may consider running it with the life payment as the only option for casting and it is an adequate combat trick in that role. For Limited the instant nature and usefulness to any deck as an offensive boost for damage to the opponent, additional poison counters with an Infect creature, combat trick to help destroy an enemy creature, or possible protection against damage based removal makes it viable for any build. In Sealed this can be played even if Green isn't in your colors as the one life is worth it to deal two damage to your opponent and is an even better deal if it adds two poison counters. For Booster this can be a fairly early pick as it works with any deck and is quite versatile making it playable in every stage of the game. Welcome to another week pf New Phyrexia previews here at Pojo.com. Today we are taking a look at Mutagenic Growth. Mutagenic Growth costs one green Phyrexian mana. This means that you can either pay one green mana for it, or spend 2 life to cast it. Mutagenic Growth gives a creature +2/+2, and is an instant. Mutagenic Growth may almost dethrone Giant Growth only for the fact that you can cast the pump without mana. All tapped out? Cast 4 Mutagenic Growths and give up the eight life, dealing more so. Your opponent won’t see it coming! Even using one of them with an infect creature and a Giant Growth could end the game for your opponent. Needless to say, an instant favorite for anybody running green, just for the versatility. And don’t worry about the life loss. Most green decks either gain some life along the way, or kill before the opponent know what hit them.